Five Layers of MicroSpring Textile cushion the heels and ankle bones while two layers protect the foot and toes. 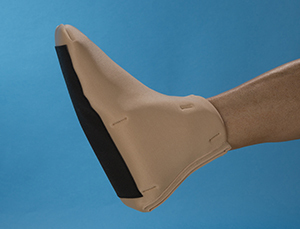 DermaBoot covers the entire foot and ankle. Can be worn while walking with non-slip bottom. Available sizes measured from heel to toe: Small - 7" to 8 3/4" Medium - 9" to 10 3/4" Large - 11" to 13"